Neumann and Supraphon were first in the complete recorded Martinu symphony stakes. I remember those pioneering LPs - a mix of single discs and a very ungainly 2LP boxed set that married symphonies 3, 4 and 5 with all sorts of disruptive side breaks (you remember side breaks!). Eventually a 4LP boxed set was issued before the CD ruthlessly swept the unlamented vinyl off the retail shelves. 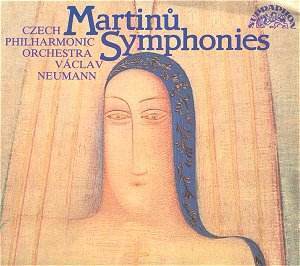 We are talking about the very late 1970s before the Martinu /Neumann LPs emerged in the US and the UK. The wonder is that it had taken so long for Supraphon to record all six. When they got around to it they did the whole project in Prague from January 1976 to September 1978. Before then you had to make do with various LPs and 78s: Unicorn's production conducted by Dr Michael Bialoguski (with the New Philharmonia - coupled with a - or the - Vorisek symphony) of No. 6, Ancerl's 5 and 6 (mono), No. 2 conducted by Sejna on Czech 78s, No. 6 on mono RCA (Boston SO/Munch), No. 5 on Louisville conducted by the tireless Robert Whitney and the LP that won over so many to Martinu , the stereo Supraphon of the Fourth Symphony conducted by Turnovsky. In the CD age Behlolavek has recorded 1, 4 and 6 on Chandos. His No. 4 (another version) coupled with Otakar Trhlik's version of No. 5 is on a Panton CD I have been trying to track down. Fagen's cycle on Naxos has so far proven rather plodding and lacking rhythmic vitality. On UK BBC Radio 3 we could console ourselves with Zdenek Macal (now a Delos man!) conducting the Hallé Orchestra in the First Symphony in the broiling summer of 1977. A couple of years before that Christopher Adey did a remarkable cycle of all six with the BBC Scottish SO. It was Adey's brilliant traversal that drew me further into the Martinu whirlpool. How I wish I had recordings of those Adey performances. Can anyone help? The Supraphon notes (they seem to have been written in 1989) by Jaroslav Mihule (an expert on the composer who has written several books on the subject - sadly not translated into English) are exemplary. They buck the Czech trend of years gone by when Supraphon LPs were usually 'blessed' with hilarious translations into quasi-English. Mihule's information is date, place and person specific. Musical analysis is left on the sidelines. Biographical backdrop is carefully placed alongside artistic cross-reference. Models for imitation please. The First Symphony was written within a year of the composer's dispossessed arrival in the USA. It was begun in May 1942 in Jamaica and finished quite quickly in 15 weeks - this the longest of the six. By then Martinu was 51 - a late age for starting down the symphonic route - although Brahms was also a late starter. Koussevitsky commissioned the symphony (alongside Bartók's Concerto for Orchestra and Stravinsky's Ode) in memory of his wife, Natalie. The Second came within a year; and thereafter the symphonies were produced one a year until 1946. Brian Large's Duckworth book on Martinu (long out of print) tracks over the development of the symphonic form. No. 1 is in a conventional four movement pattern; No. 3 reduced the middle section which developed further into an effective two movements (there are nominally four) in No. 4. The Sixth is in the nature of a set of fantasy variations. Large also claims the Frescoes of Pierro della Francesca and The Parables as symphonies manqué - effectively numbers 7 and 8. The First is romantically inclined - thick with images of seas thriving with swirling plankton, effervescently irrepressible, the stamp of the Rite of Spring, the chuckle of Petrushka, the third movement a funereal reflection rising to a great string anthem - the equipoise of the whole work. Joy is unleashed in the finale predictive of the life force of the Fourth Symphony. The Second is innocently pastoral - naively flowing in the gracious and serene manner of Dvorák in the Serenade for Strings and the Eighth Symphony. There are impressionistic traces as well. These were picked up from his Parisian years and parallel his First Quartet The French. The piano often plays a noticeable role in the orchestral works whether or not designated as a concerto. In the Third the role is prominent - especially noticeable in the massive-feeling first movement. In the final movement there are Tallis-like moments as well as the insect buzz of the Sixth Symphony. The optimistic woodwind calls are superbly recorded by Supraphon's analogue engineers who also capture the sweetest of high arching strings. While the Fifth and Sixth are popularly singled out as the strongest of the sextet my vote goes to the Fourth as Martinu 's most lyrical, heart-easing and dynamic inspiration - truly a gripping symphony. In the second movement Neumann outpoints the famous Turnovsky for tensile snap and malevolence. The brilliance of the brass writing in the last movement must surely have been influenced by Janacek's Sinfonietta and Ravel's orchestration of Pictures at an Exhibition. The Fifth is, to my ears, Beethovenian with the stomp of Beethoven 5 and 7. Kleiber (fils et père) would make, and would have made, hay with this work. Neumann brings out the brusque vitality and violence of the score as well as its iridescent transparency and diaphanous translucency. While Number Four is a work of perfection - equipoise of poetry and dynamism - numbers 5 and 6 have always struck me as flawed in comparison though the Neumann gives the Fifth the best performance I have heard. In the finale Neumann and Martinu find ecstatic revelation in the line between melody and rhythm. The Sixth is static - more easily heard as three independent fantasies than as a symphonic unit. Number Five has motion and emotion but misses the exalted thematic production and elation of the Fourth. Neumann makes of No. 5 the best case I have heard and his Fourth is only a notch or two down from the classic (and anyway unavailable) Turnovsky (reissued on CD very briefly on the American Urania label). Behlolavek on Chandos is also excellent. The Sixth's murmurous buzzing (for all the world like a great cloud of locusts) may well be linked to the buzzing noise he heard in his head following a serious fall within years after he arrived in the USA (parallels with the whistle heard with the onset of Smetana's deafness and reflected in his String Quartet No. 1 From My Life). Neumann conjures the scorching updraft of a torrid summer's day - perhaps with memories also of the Mistral and the Föhn winds. Martinu has treated us before now to anthems hymned out to an impassive firmament and so it is here. In mastery the theme approaches Barber's Adagio but retains aristocratic restraint. The Sixth Symphony is the only one to bear a title and like Sibelius's Seventh (and similarly final) symphony it cross-fertilises symphony and fantasy. Unlike the Sibelius the Martinu is in his three movement template rather than a monolith. There are younger and, it has to be said, more transparent recordings than these Supraphons. Claus Peter Flor on RCA/BMG seems rather under-muscled though, truth to tell, I have not heard the CD of numbers 3 and 4 (if anyone has a copy please contact me at rob.barnett@ukgateway.net). Neeme Järvi is much more imaginative and is well worth hearing. He is handsomely served by BIS with the first purely CD and DDD cycle. The Neumann is stereo but AAD - not digitally remastered. Bryden Thomson on Chandos did the complete cycle and interpretatively his set is highly regarded although the Scottish National Orchestra (as it then was before it gained its 'Royal' handle) has come in for some stick due to various roughnesses. Neumann brings warmth and élan to the symphonies. In the First Symphony there is a trace of harshness on the strings. Generally however the recording leans towards warmth and atmosphere rather than to transparency of detail. This works well most of the time and is well suited to the soundwashes of the Sixth. Number Four, which is an exemplar of plangent and luminous orchestration, is lovingly advocated by engineers, players and conductor. This Supraphon is not a fashionable choice and its presence on your shelves may draw quizzical looks but try defying fashion and you will find this a rewarding and persuasive companion.